This chapter outlines the other setup options beyond the General Preferences set up, and advanced configuration options for access control, users and groups, using external databases and server memory allocation. onCourse has full general ledger capabilities, ensuring you are always aware of your profit and loss, liabilities and cash position. You can create your own accounts as needed, by selecting the '+' option. Accounts no longer needed can be disabled. A range of reports are available to keep you on top of your financial position. Refer to the chapter on Reports for more information. 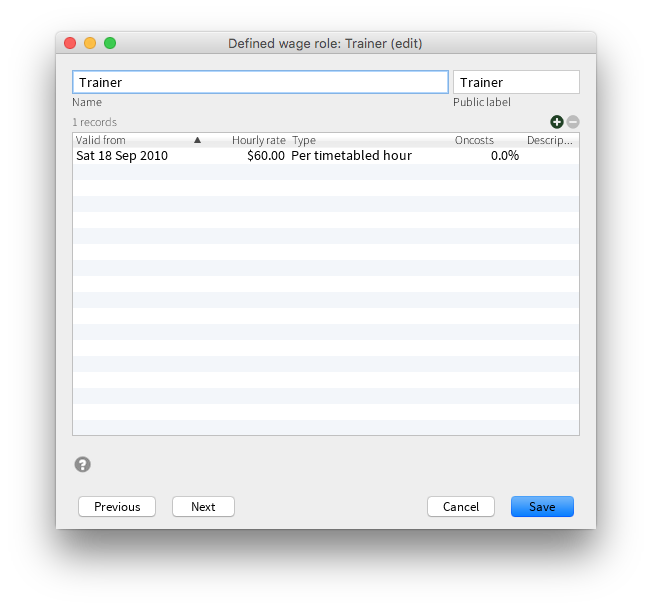 Tags are a way to customise onCourse to group and sort data based on your business rules. They are also integral to website navigation. Refer to the chapter on tags for more information. 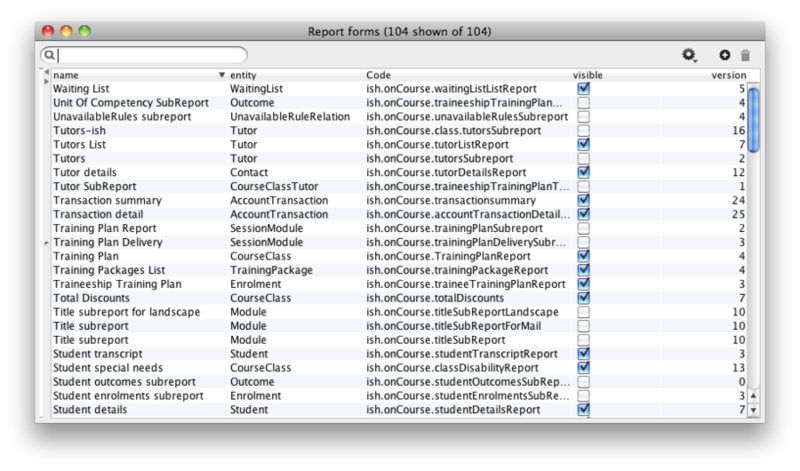 This is where you can add or export the existing report templates for you to customise. 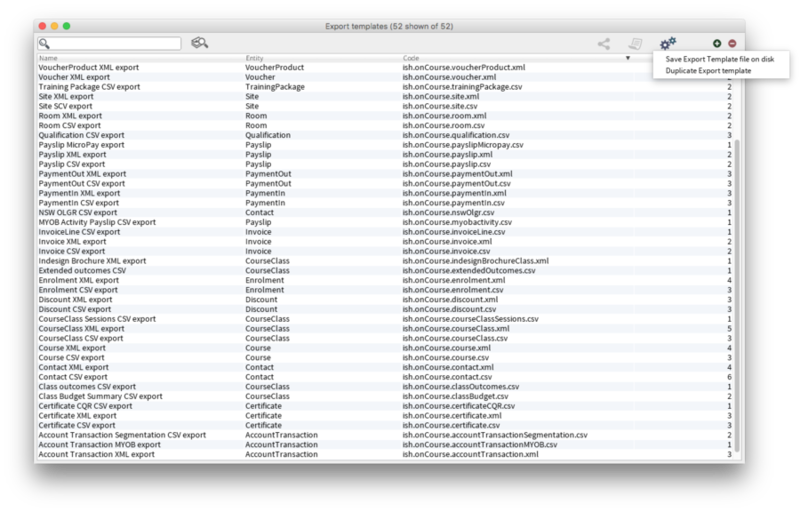 This screen lists all the available export templates. Both XML and CSV templates are available for most data within onCourse, allowing you to export your onCourse data for use with other types of software, like spreadsheets, other databases and desktop publishing tools. If you create your own custom exports, or commission ish to create some on your behalf, you can add them to onCourse by clicking the +, locating the export template on your computer, and importing it into onCourse. The template will be immediately added to the list. If the template already existed and this was just an updated template, then the version number will be incremented. Duplicate Export template - This will assist users when creating their own custom templates, using an onCourse template as the starting point. The key code will be left blank in the duplicate process for you to create your own unique code. These templates are the emails that are sent automatically based on scripted events like on enrolment, or as part of daily reports. By default, only emails and scripts relating to Enrolment confirmations, tax invoices and voucher purchases are active in all new onCourse installations. You can active and de-activate other scripts are required. We recommend you customise the fixed text in these templates to meet your own terms and conditions for payment, refunds and transfers. Both plain text and HTML templates are included and can be edited. You can also add your own templates and scripts to onCourse. These templates also require you to complete some contact details, for example the AVETMISS details, to generate your college email, phone and web address. 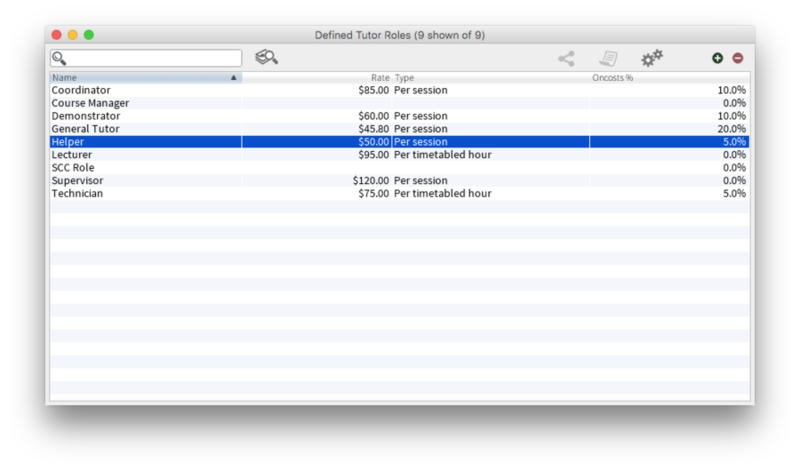 You can edit any of the tutor roles by double clicking on any of the roles. To access the "Users" menu, in onCourse go to File > Preferences > Access. You can edit an existing access role by double clicking on it, or create new access roles using the + button in the top right hand corner of the window. 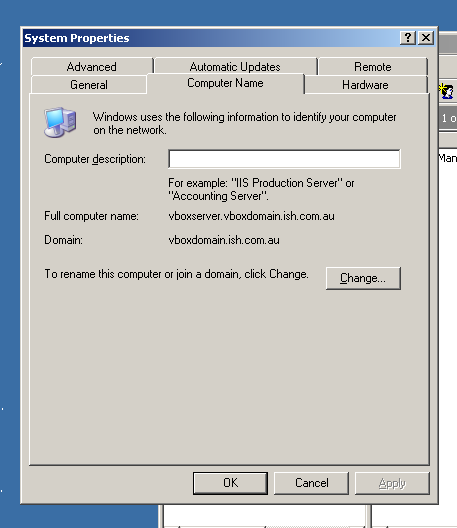 The below example has been completed with Windows Server 2003 R2 SP2 and onCourse 1.7.13. onCourse has the ability to use an external LDAP/AD server for authentication and authorisation, what we mean by this is that you do not need to use the onCourse user and group database but you can use your already setup AD database. Firstly on your Windows Server 2003 Machine go to "My Computer" right click and select "Properties" and you will find the following screen. Please take careful note of the "Full Computer Name" and the "Domain" as with this information you now have the building blocks for our configuration. and add it to the administrators group and remember your password! Once you have substituted all of the settings as necessary press the "Test Connection" button to ensure that onCourse can bind to the LDAP server. Once that works, you can then go to the "Users" section of this configuration page and place "sAMAccountName" and (objectClass=user) for the search filter. Now test a user in your domain and see if it authenticates. If it works, congratulations you are now authenticating against your AD server! At the top of your "Active Directory Users and Computers" create an "Organizational Unit" (OU) and call it "onCourse". You can add or delete roles here as you wish but a corresponding group must exist in AD for the authorisation/access rights to be allocated. When you have created those groups in AD add the necessary users who belong to each group. 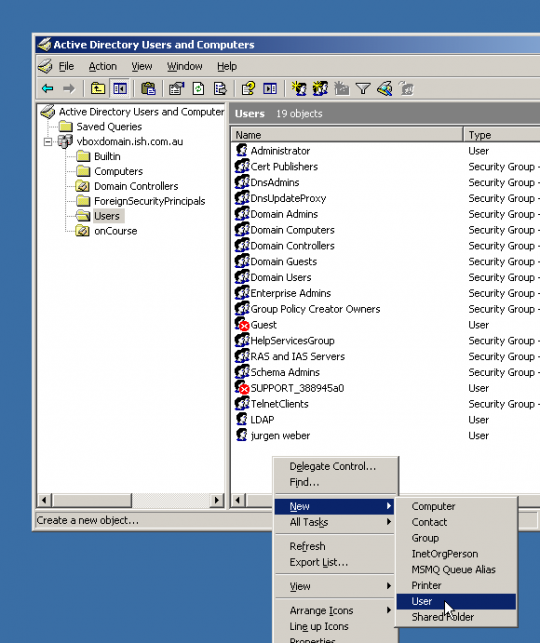 That is all for Windows Server AD/LDAP authentication and authorisation! good luck! Sometimes the onCourse server defaults aren't perfect for your office. Ports may be blocked, another server might already be set up. We've added the ability to specify useful parameters in a configuration file that onCourse Server will check on startup. Create a text file called with the name 'onCourse.cfg' and place in the same folder as the onCourse Server executable, whether that be running on Windows (.exe), OSX (.app) or Unix/Linux (.jar). ip – specify which IP addresses to listen on. Repeat this line as many times as you require. ssl_port – specify which port to listen on for SSL client connection. db – specify and URI for your database. client_server_compression_level - compression between client and server connection. 0 is off, 6 is default and 9 is the maximum compression setting. More compression uses more CPU at each end. onCourse will replace all white spaces with '%20', If you use windows or there are white spaces in the URI path you must surround the URI with ". In order to connect to external databases such as MySQL and MS SQL, onCourse Server needs to know where the external database lives. This can be done by using a server configuration file, see the section called “Server configuration file” below. Starting the server with special arguments (in the cases of headless configurations commonly found on Unix-derivative systems such as FreeBSD, Linux and Solaris), or choosing the external database option through GUI when first starting onCourse Server. connecting to an external database is a paid for feature, you must contact us to enable it. It is not necessary to specify a port, if the default port is used. In addition, you can specify a different memory utilisation for onCourse Server. onCourse Server will try to use all the memory you allocate to it, since it makes use of that memory for caching. Up to a certain point, adding more memory will help, but after that more memory will have no effect or even slow things down since the server has more work to do managing all that cache. You will have to tune your settings according to your own needs, but the default will do fairly well for most installations. That will increase the cache to 1500 Mb for onCourse Server. About another 80Mb will be used by the application itself, so the total usage will be those two combined. On Windows 32bit, never go past 1.5Gb for onCourse because of limitations in Windows. A Unix or OSX 32bit environment will allow you to assign up 3.5Gb. The onCourseServer.log will report errors of java.lang.OutOfMemoryError if you have given the onCourse Server insufficient RAM for your usage requirements. Prior to this your end users may also detect processing errors, such as failing enrolments. Beyond what you have allocated to onCourse, make sure the server has sufficient RAM to run the operating system and other applications. It is very important that the server doesn't swap memory to disk at any time or you will encounter major performance problems. In a 64bit operating system you can install more than 4Gb of RAM in the server memory. OS X users will be running 64bit by default. We recommend installing 64bit operating systems for all servers. 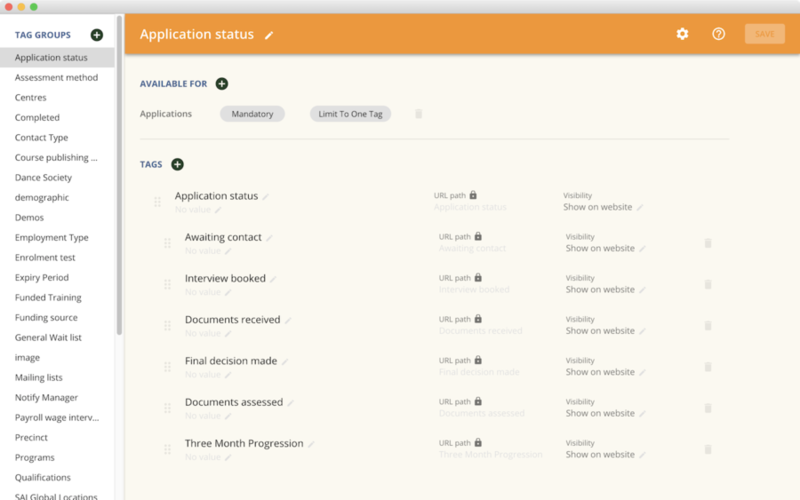 The onCourse server application and the onCourse client application both create daily log files. The onCourse server log levels are set by the onCourse database manager inside the config file. 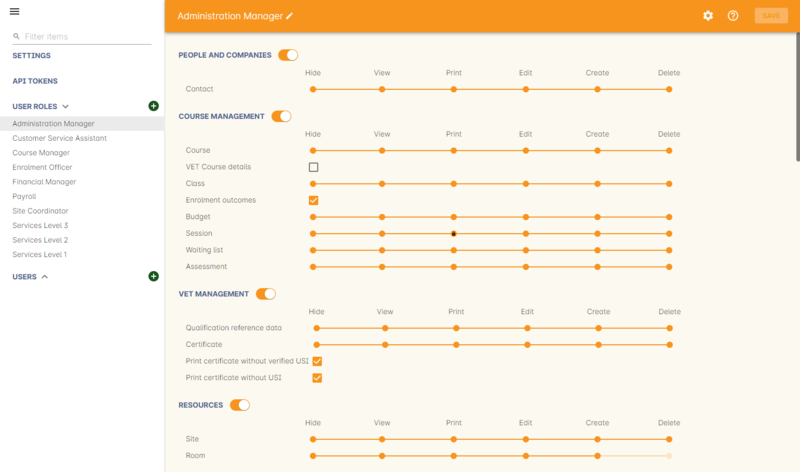 The onCourse client logging can be set from inside the onCourse application. In the Help menu, select the option 'Set log level' and choose from DEBUG, INFO or WARN (default). If you need to access your client log files you can find them in the OS User home directory, or use the tool inside the onCourse Help menu to open the folder directly 'Show onCourse client logs..'. Historical log files will be zipped and include the date they were logging within the file name. The current log file being written will be called onCourse.log. Available from the preferences menu is the option 'Audit Logging'. Audit logs are created when a record is created, edited or deleted. When a script fails or an email key collision occurs, an audit log record is also created. The Audit Log list view window displays all entities edited or created by each onCourse user and the date and time of that action. The advanced search function in Audit logs allows you to search for a particular type of log e.g. script failure or log from a particular user. Double clicking on the audit log for a script failure or email key collision will provide additional information in 'message' field in the edit view. Edit, create or delete logs do not show any additional information in the edit view. 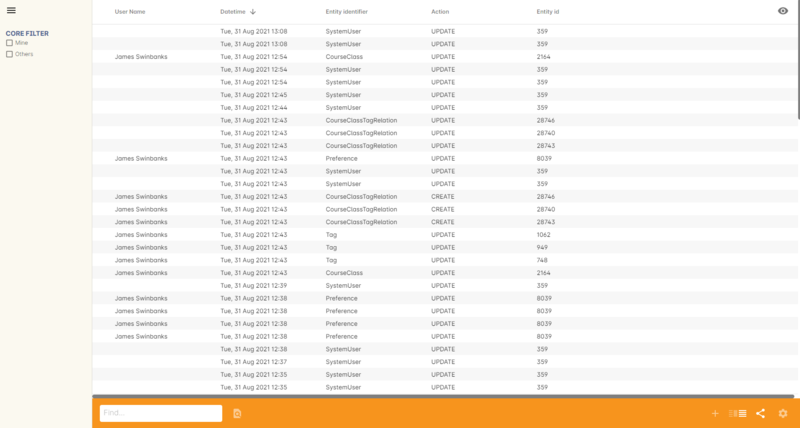 You can also access the audit logs for a particular record by using the 'find related' feature from any list view. 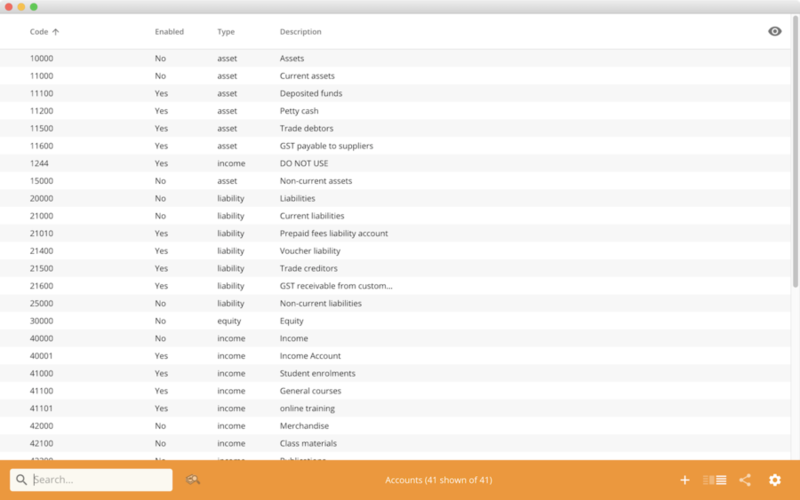 For example, you can select a class and find the related audit logs for that one particular class, or from the user account record, all audit logs for one particular user.